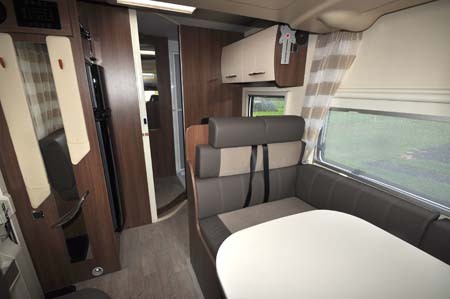 Anyone who thinks innovation is hard to come by in the world of motorhomes could do themselves a favour by investigating the offerings of Chausson. If you’re expecting them to break the bank you might want to re-consider, also. The Flash 610 is a perfect example. 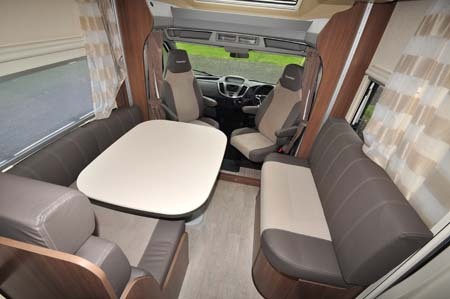 Already judged Motorhome of the Year 2015 by the publishers of the UK’s two leading specialist motorcaravan publications – MMM and Which Motorhome – it sounds like it’s going down a storm in the sales charts, too. Maybe that’s not surprising, considering what’s on offer here. Large lounge, equally spacious washroom, gi-normous wardrobe, garage with three-way access, full-size double bed… yet overall length is a whole centimetre under seven metres (21ft 11in, if you prefer). And OK, the canny among you might have spotted no mention of the kitchen. Arguably, this is the sole Achilles heel of a motorhome that otherwise excels. It’s all a bit token for the travelling chef, despite a 175-litre fridge/freezer, three-ring hob, separate sink and some generous soft-closing drawer storage. Rather, the grill is set far too high, there’s virtually no worktop when the cooker and sink lids are open and there’s not really sufficient space to consider adding a microwave. All around, though, things are significantly better. That lounge could comfortably sit around seven people. It also a large enough pedestal leg table to cope, too. Overhead, there’s an electrically operated drop-down bed. The table also has electrical height operation, so once the settee backrest is out of the way and the table suitably lowered, it’s easy to get the bed down to a level where you really can just hop in – and it doesn’t obstruct the habitation doorway. It’s a generous enough 1.93m x 1.38m, tapering to1.28m wide. If you want to sleep four, the upper bed can be set so there’s space to create a 2.17m x 1.45m double from the lounge seating. Another star performer here is the washroom. 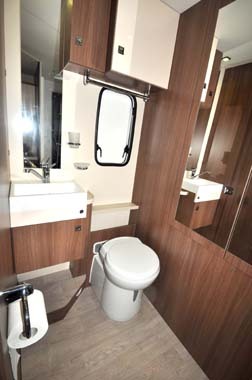 Located beyond the kitchen, its space-saving tambour door allows you to close it off and there’s then plenty of dressing room space between the toilet (on the offside) and the shower cubicle on the nearside. And that wardrobe? It really is huge – offering not just hanging space but also shelving to three sides via its twin, mirrored doors – all easily to hand beyond the washroom, too. If you think storage elsewhere has suffered, just don’t forget that garage at the back. 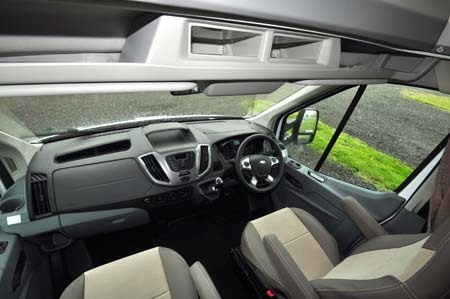 Unusually, it offers access via both sides as well as a large hatch across the back of the vehicle. Plus, there are single 230V and 12V sockets here – ideal for charging your e-bike. 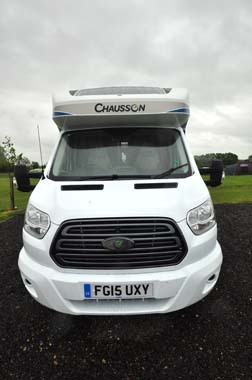 It’s worth knowing the choice Chausson gives, too. Its models are available in Flash or more upmarket Welcome trim levels – the latter versions start at around £4,000 more, then also go on to offer even more enticements from the options list. Plus, you can also specify either a Ford Transit or a Fiat Ducato base. 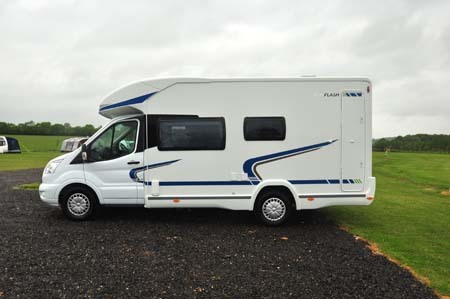 The MMM/Which Motorhome judges deserve credit here – awarding the Ford-based Flash version of the 610 with their ultimate accolade. Ford’s latest Transit really is impressive, too. Once you get beyond that singularly ugly front grille, it really is all very sophisticated, with a cab that – it has to be said – comes far closer to car-like in terms of its quality and equipment than the otherwise all-conquering Ducato can muster. If you want automatic transmission, though, you’ll have to jump across to Fiat. Flash or Welcome? Ford or Fiat? The choice is yours… this 610 really is a cracker. And you don’t need to be a safecracker to own one. There’s more information on the Flash 610 on the Chausson website and to find out more about our low-cost premiums visit the motorhome insurance discounts page. We believe they are 16 inch. The tyre size quoted on one blog was 215/65 R16C. I’ve had a 610 Welcome since April. 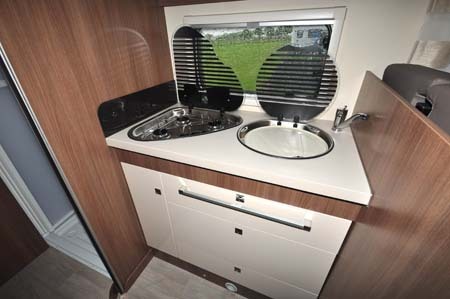 While it’s a bit utilitarian inside, it’s my first motorhome so I’ve nothing to compare it with, & as I have a hairy dog I wouldn’t have wanted anything posher. There have been a few minor issues, such as an LED panel failing, which have been fixed under warranty by the dealers (Knowepark Caravans Livingston) without any problems at all, and the interior lighting could be better. The Ford (155hp) drives very well, although the wind noise from the overcab moulding can sometimes get quite loud. I can understand comments about sacrificing lounge space for a bigger kitchen, but the lounge has to be that size to accommodate the bed, and I’ve never felt desperately cramped while cooking. The storage is amazing, as is the roomy loo. My biggest gripe is the waste water: the van has to be driven over a drainage grating, and not every campsite has such a facility. Otherwise, I’m thrilled with it. Thanks for your comments Alistair. It would have been useful to include a picture of the (open) garage in the article, or at least how big it is. I have had nothing but disappointment with my Flash 10. It spent last winter at Lowdhams to have the toilet door sorted ( would not meet the wall) they were unable to fix. Washroom a wash out! It also had a long list of problems including having to have waterpump replaced. Chausson never NEVER AGAIN. Poor build quality, rattling habitation, don’t age well, warranty and after service poor, popular hire vehicles due to cheapness, finance deals and throw away after 3 years attitude. My Chausson experience has been stressful and will avoid in future, my advice buy good make second hand. Can’t see the point of seating for 7 sacrificing useful kitchen space. Mostly campers are for two to four people surely and socialising with seven people in such a small space seems ridiculous let alone unlikely. Very good summing up, however where do you store the bedding?. In response to your query, bedding can indeed be stored on the bed in its up position. Someone need to think about pop-up roofs (VW did Decades ago). Affords head room, storage when at campsite and potential sleeping quarters. Finally what about a slide-out. The Americans have been doing it for decades as well. We are European our’s will be lighter, better quality and we could expand the luxury market.